Welcome to WA's first Earthcache at Yalgorup National Park. To log your find you'll need to answer the simple questions found on site as proof of your visit. What are the names of the two 'red' birds that visit here? Where was the wetlands convention signed? What is the Nyoogar name for Lake Clifton? Who was the Lake named after? After you've found the cache you can visit the Cape Bouvard winery next door for lunch or a wine tasting. Now you have double the reason to stop and visit. 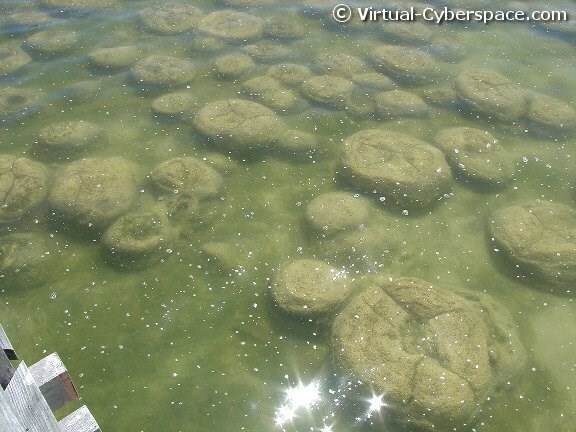 Living Rock-like structures known as thrombolites can be seen on the edge of Lake Clifton. The thrombolite building micro-organisms of Lake Clifton resemble the earliest forms of life on Earth. The discovery of modern examples helped scientists to understand the significance of micro-organisms in the environment and unravel the long history of life on Earth. These organisms were the only known form of life on Earth from 3500 million to 650 million years ago. The thrombolites they constructed dominated the clear, shallow seas of this period and formed extensive reef tracts rivalling those of modern coral reefs. Similar organisms, for instance, helped to form the rich iron-ore deposits of the Hamersley Range, in the Pilbara's Karijini National Park, some 2000 million years ago. At this time oxygen made up only one per cent of the atmosphere. When there was no more iron to precipitate, the free oxygen leaked into the atmosphere until it formed 21 per cent of atmospheric gases. Today living examples of these once completely dominant organisms are restricted to only a few places. So why do thrombolites grow at Yalgorup? Scientists have suggested it is perhaps because Lake Clifton is associated with upwellings of fresh groundwater that are high in calcium carbonate. 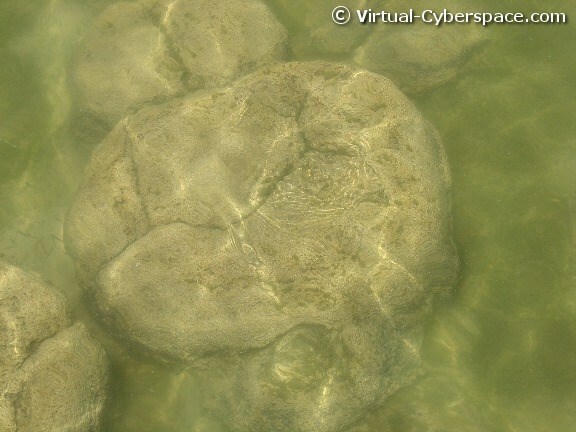 The micro-organisms living in this shallow lake environment are able to precipitate calcium carbonate from the waters as they photosynthesise, forming the mineralised structure that is the thrombolite. The significance of thrombolites and stromatolites to science is inestimable but they are very fragile and can be degraded by visitors walking over them. To protect the thrombolites, an observation walkway has been built to minimise any impact from visitors wanting to see these fascinating structures. The Yalgorup lake system is so significant for waterbirds that it is recognised under the international Ramsar Convention (named after the place where it was signed in Iran). The lakes provide important habitat for the international transequatorial waders that migrate from the northern hemisphere. These waders include the bar-tailed godwit, greenshank, whimbrel and three species of sandpiper. Other waterbirds that use the lakes include the banded and black-winged stilts, red-necked avocet, red-capped plovers, Australian pelican and coot. Surveys carried out in south-western Australia between 1988 and 1992, showed that the Yalgorup lakes consistently supported the highest numbers of musk ducks and, in 1990, supported the most Pacific black ducks of the areas surveyed. The lakes also had the third largest numbers of black swans recorded in 1988 and consistently support high numbers of shelduck in early summer (13,899 at Lake Clifton in November 1988). Black swans also live in high numbers at Lake Pollard, where they graze on extensive growths of stoneworts (musk grasses). The quacking frog, turtle frog and slender tree frog are among the eight frog species that inhabit the park and the long-necked oblong tortoise is present in Lake Clifton. People are also drawn to Yalgorup National Park. It offers visitors panoramic views of the beaches, dunes and lakes from several high spots. 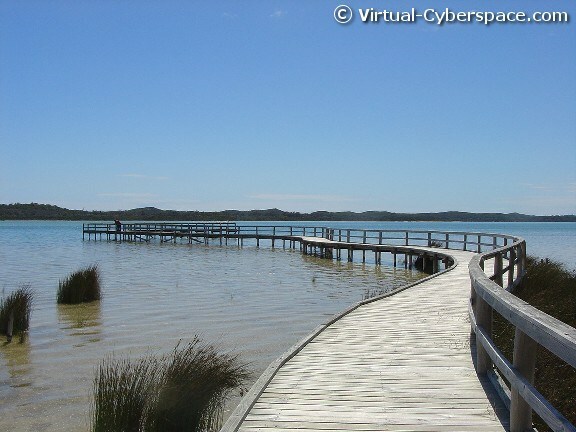 Peaceful settings among the patches of tuart forest and woodland, and sweeping views over the tranquil lakes, give the area a wilderness feel and attract an increasing number of visitors. Lieutenant Surgeon Alexander Collie and Lieutenant William Preston, together with a boat party, first came across and named Lakes Preston and Clifton while exploring the coastline between Mandurah and Bunbury in 1829. In the 1850s, shortly after the introduction of convict labour into the State, the 'Old Coast Road' south of Mandurah was rebuilt by convict road gangs. For most of its length, the road ran through well-timbered, sandy limestone country of little value to agriculture. Except for a number of small holdings that had been developed by the early 1870s near fishing grounds on the western shore of the Harvey Estuary, settlements near the Old Coast Road were quite scattered. However, only in the early 1970s was Yalgorup National Park formally established to protect the coastal lakes, swamps, and tuart woodland between Mandurah and Myalup Beach. Permission to reproduce the above information kindly granted by John Hunter from the as then The Department of Conservation and Land Management. Visit DPAW's NatureMap website. Thanks to those involved in making this cache possible Gary Lewis at the EarthCache Website, John Hunter from The Department of Conservation and Land Mangement.